Modena 27c HE Combi is a highly efficient, wall mounted, gas combi boiler with an output of 27 kW. 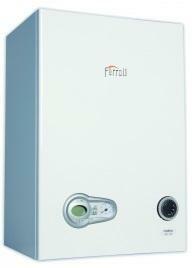 It is one of the smallest, lightest and quietest combi gas boilers. The compact size means it can be put anywhere in the house. With only four moving parts, the pump fan gas valve and DHW water flow meter it is a very easy boiler to be serviced and maintained. It has no plate to plate heat exchanger or diverter valve which guarantees reliability. It is available with many different options such as the choice of natural gas and LPG as well as an optional external temperature sensor kit and flexible flue options. It includes 5 years parts and labour warranty and an offer to upgrade it to a 7 year or 10 year warranty. It is recommended by the energy saving trust. Also available in, 32kW and 38kW.